So, I have to start out by saying running with a stroller/baby is not easy. It’s not crazy hard but it’s definitely a step up from running solo. But it’s definitely obtainable and with time you will feel weird running without them! I asked on Instagram if you all had any questions and I was actually surprised by the amount I got. I love that there are so many mom’s out there wanting to run with their kids. I’ll start out with answering some of those questions then giving some tips and lessons I’ve learned a long the way. 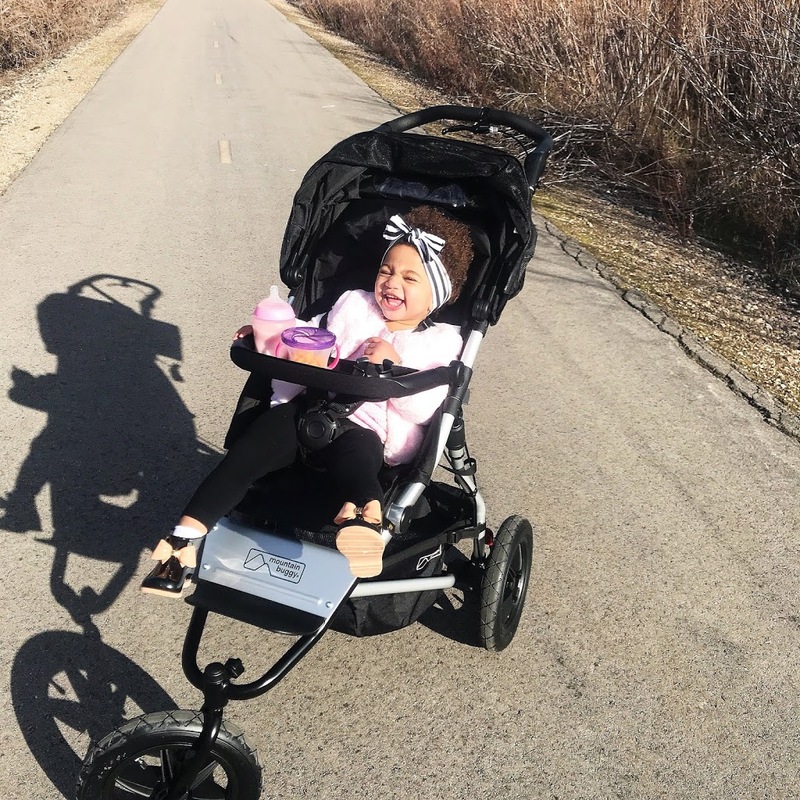 Oh, and make sure you keep reading because I’ll give a full review on my running stroller as well! Q: How do you deal with crying babies? Do you stop every time or just keep going? A: I definitely had this problem when Lemmon was a baby but not as much anymore. They grow out of the crying and start asking for everything 😉 But when she was a baby, I would first try to talk to her while I was running (fact: you should be able to keep up a simple conversation while you’re on your run.) Sometimes just the sound of your voice, knowing you’re there, will soothe them. If that didn’t work, I would stop and have her see me for a moment and tell her everything is going to be okay. I would then keep going. Some times I would stop every 10 minutes. But I always thought “Hey! At least I got in a run!” There was one time where she just wanted to be held and that was it. So at my half way point, I walked the rest of the way back. It sucked but like I said, it only happened once. But you HAVE to be consistent with your runs for your baby to realize that this happens every week and she will be okay. If you only run once a week or here and there, they will continue crying because they aren’t used to seeing or hearing you every couple of minutes. Q: How old was Lemmon when you started running with her? A: I first wanted to get clearance from her pediatrician, so I waited till she was 9 weeks. I was so nervous that she was going to get shaken baby syndrome from it being a little bumpy or that she couldn’t be in the stroller for that long. But our pediatrician said I could have taken her as soon as I was ready to go out on a run. As long as she is laying flat and secured in tight. Our next baby I will definitely go earlier. Q: Does she ever want to get out mid run? How do you keep her entertained? A: Surprisingly she stays put 99% of the time. I don’t stop on my runs, unless I am at my half way point. I then will stop for 3-5 minutes tops because I don’t want her to get antsy. I bring about 3-4 snacks with me and a bottle/sippy cup for her and her blanket sometimes. Animal crackers are great to bring because they play with them and then eat them. I try to keep her engaged at the scenery when we are running. I’ll point out any dogs on our trail or the horses too. Sometimes I’ll pick up some sticks for her and she will play with those for a bit. The key is to not run to far with them. They can only last so long. I don’t go past 5 miles with Lemmon, one because I can’t push her for that long haha and two because she wont last that long. Q: How do you work up the stamina? A: Before I started running with Lemmon I would walk 1-2 miles with her every day in the stroller. Then when I started running with her I did 2 miles first for a few runs then saw she was okay to keep going longer. Before Lemmon my time meant everything to me. I always wanted to beat my time on each run. I wanted to keep an average pace on my long runs. I stopped looking at my time the moment I started running with the stroller and just focused on how far I ran. I still do that now bc she weighs so much haha. But also remember, a bad jogging stroller will make your runs a lot harder as well. Q: Do you run pushing the stroller with one hand or both? One hand and I switch off. I tried with both and I felt like it was so much harder. The biggest change for me was my stroller. 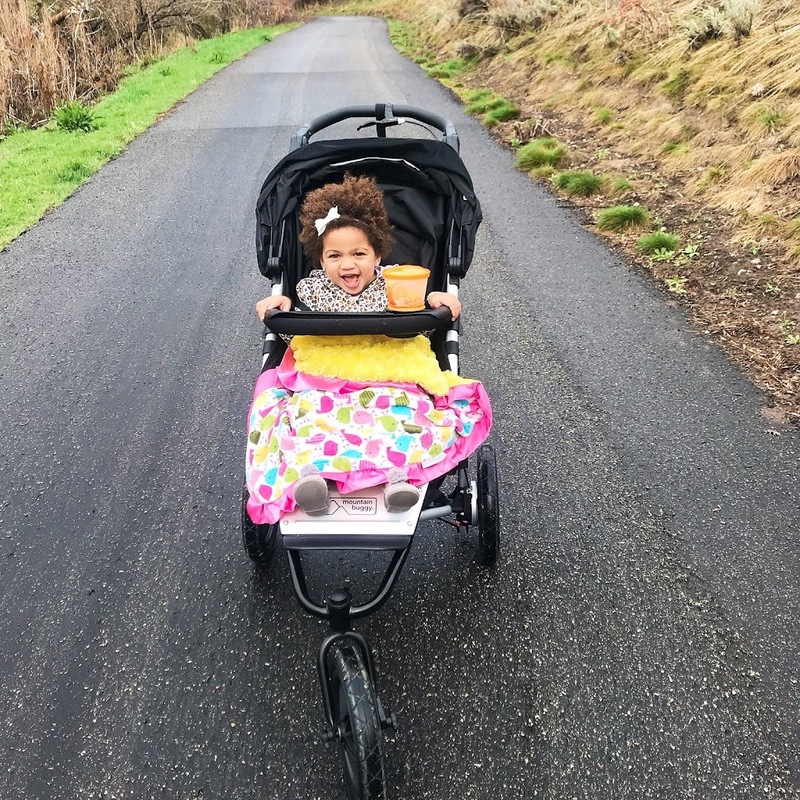 I started out with a graco jogging stroller, it was all we could afford at the time and we needed something that could double as an everyday stroller as well. It did it’s job of moving, but was very hard to turn and very heavy. If you can afford it, get yourself a real-legit jogging stroller. 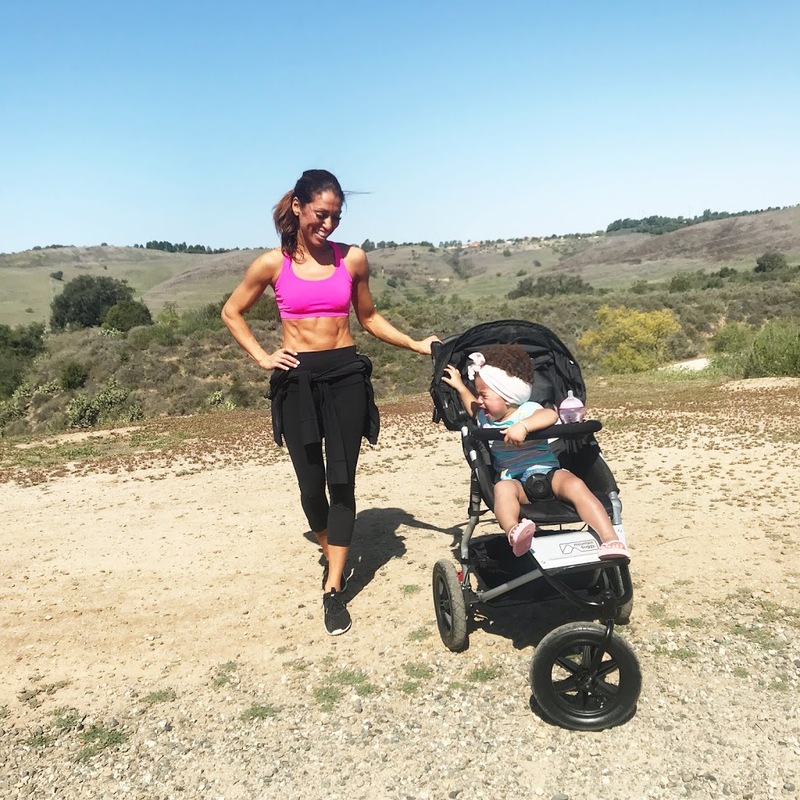 I use the Mountain Buggy Jogging Stroller and am obsessed with it! I actually like it better then my everyday stroller because of how beautifully it glides. It has an eating tray for Lemmon and all her snacks and it reclines back so she can nap if she choose to. I also love that it has a few different braking features and also a big storage on the bottom. You’ll notice how much lighter it is to run with a good stroller and you’re pace will increase also.